When John F. Kennedy Jr. arrived on the quiet campus of Brown University back in 1979, the eyes of the world – and the buzz of rock star celebrity – arrived with him. John was the crown prince of American politics and the closest thing to royalty anyone had ever seen in the U.S.
As a child, John had played at his father’s knee in the oval office and saluted the casket at his funeral. 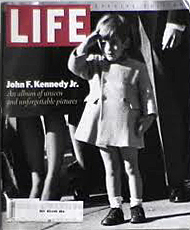 Everyone loved John and watched his every move as he grew up – frequently on magazine and tabloid covers. So I was delighted to see John walk into my small (12 students) Political Science seminar that first semester, to study the Vietnam War and his father’s administration through the lens of David Halberstam’s classic book, The Best and the Brightest and the sobering collection of government documents known as The Pentagon Papers. Needless to say this class had some interesting discussions, including a friendly debate or two between John, the scion of East Coast liberalism and me, the West Coast conservative from Ronald Reagan country. But mostly John and I enjoyed history and talked sports. What I recall most and what I want to emphasize here today is that John was the most impressive person I’ve ever met. I say that knowing I’ve met some fairly impressive people over the years including Oscar-winning actresses, Super Bowl-winning quarterbacks, self-made millionaires and even a successful trucking company owner whose wife commissioned a life-size statue of him to greet visitors to their mansion overlooking the Golden Gate Bridge in San Francisco! So what made John so special, beyond his famous name – and beyond these other people? Was it his good looks, his intelligence, his athletic ability or his sense of humor? No, it wasn’t any of these qualities, real as they were. I wasn’t sure what made John so impressive until I received Christ by faith and began to explore my new identity – which ultimately became a driving force behind my book, Royal Family. During this quest for identity, God revealed something profound about John, about Jesus and about you and me. What made John so special is the same dynamic that makes you feel special when you meet the president, or your favorite musician, actor, athlete or whomever. It’s the same dynamic that makes people claim ridiculous connections like, “My brother’s friend’s aunt’s mechanic once changed a flat tire for Bon Jovi when his van broke down in Hoboken, New Jersey!” We bask in the glory that accompanies such connections. This connection is what I call the ‘halo effect.’ The closer we stand or relate to greatness, the more of its glow we enjoy (or borrow!). Now John’s case was dramatic, of course, because he didn’t clamor to obtain the contact or connection. He didn’t have to work the angles or chase down favors to get a glimpse or moment with JFK or Jackie-O. The blessing was given to him freely as their son. Grace is something you don’t deserve and can’t earn, study for, work for or even pay for. This is why we call a beautiful singing voice a gift. Yes it can be trained and improved, but the ability itself is a gift, which in the ancient Greek language = the word charism (the root word for charisma), or grace. The revelation about JFK Jr. was simply the magnitude of grace involved in his halo effect. It’s what made him so impressive, even regal. John knew who he was, who he was connected to and who he represented and yet he knew with real humility that he hadn’t done anything special to earn or deserve his special status. Yes he was connected to greatness, but he knew better than anyone he had nothing to brag about! This combination of deeply-set confidence and real humility is magnificent – and it’s available to anyone who receives the gift of spiritual adoption through Christ. Let that sink in. Read it again, maybe even a couple times. Your age, race, income, education or any other factor doesn’t matter. Let me say it again this way: Jesus enjoyed the ultimate halo effect, given his identity and unity with the Father and Holy Spirit. Yet he offers the same effect to anyone who receives him by faith. He said whoever accepted him would be accepted by his Father – and that acceptance changes everything! This new relationship is made real in our soul and spirit by God’s Spirit actively affirming the truth of our new identity as sons and daughters. It’s beyond head-knowledge, it’s supernatural! All we have to do is allow it – or better yet, welcome it! Whenever I’ve allowed the Spirit to affirm this reality, people have sensed something special about me. They’ve wondered at times if I’m extremely rich or have assumed that I’m supremely talented (or both! ), when in fact I’m neither. But I am related to the King of all creation, the one who owns cattle on a thousand hills and has done miraculous things for me! Maybe you’ve met such people along the way; they’re rich regardless of their socioeconomic status. They shine with a joyful radiance beyond their circumstances. They possess a ‘different spirit,’ just like my old football roommate Franklin King did (see my story in About Us) and they make a supernatural impression that touches lives. This is part of your inheritance in Christ, should you accept it. You are called to shine brightly and boldly like the Noonday sun. Let your life shine to the glory of God! 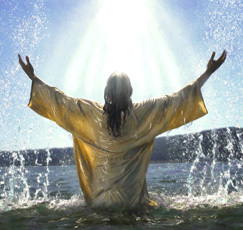 Heavenly Father, we thank you for accepting us through your son and filling us with your Spirit. We welcome your loving presence and ask you to help us rise and shine for your glory. In Jesus’ name. Amen! More of this topic is covered in my book, Royal Family. Visit our Blog page to review posts covering related themes. And be sure to sign up below to receive my blog posts via email.